Received April 2nd, 2011; revised May 4th, 2011; accepted May 18th, 2011.
grown in tropical and subtropical region of the world. and conidial morphology . F. sterilihyphosum and F.
source of MIP and TP, and the causal agent of disease. els of auxin [7,9,10]. Strains of Fusarium proliferatum, F.
tested for the production of fumonisin B1 in culture. 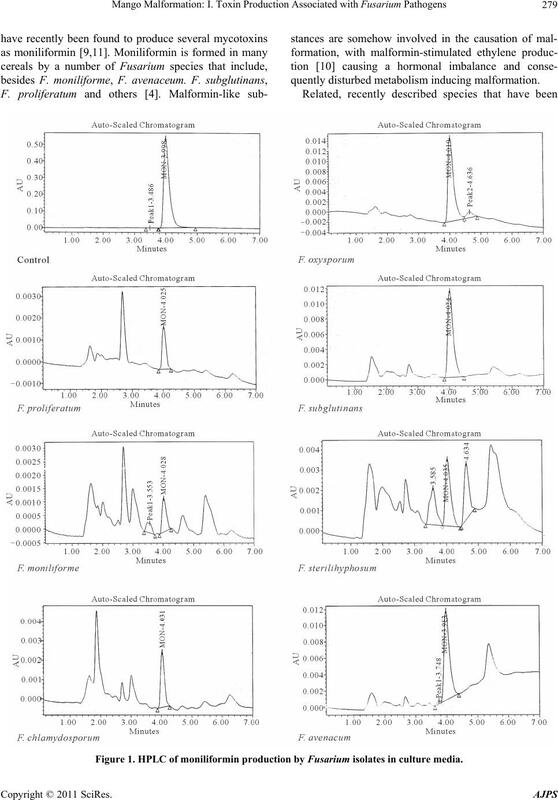 None of the cultures of F. subglutinans, F. annulatum, F.
grains millet and sorghum . ease were tested for their ability to cause malformation. of the apical buds. Sterilized water was used as a control. tion as diseases incidence and severity (from 1 - 4 scale). days. A slant was macerated in 27 ml of sterile water. NH4Cl (3 g), FeSO4·7H2O (0.2 g). MgSO4·7H2O (2 g). laboratory (Miller et al., 1994). the HPLC system and for data acquisition and analysis. tographic separation of the above-mentioned substances. lated as apical injection with culture filtrate (Table 1). dominant fungus with 100% sample’s infection. 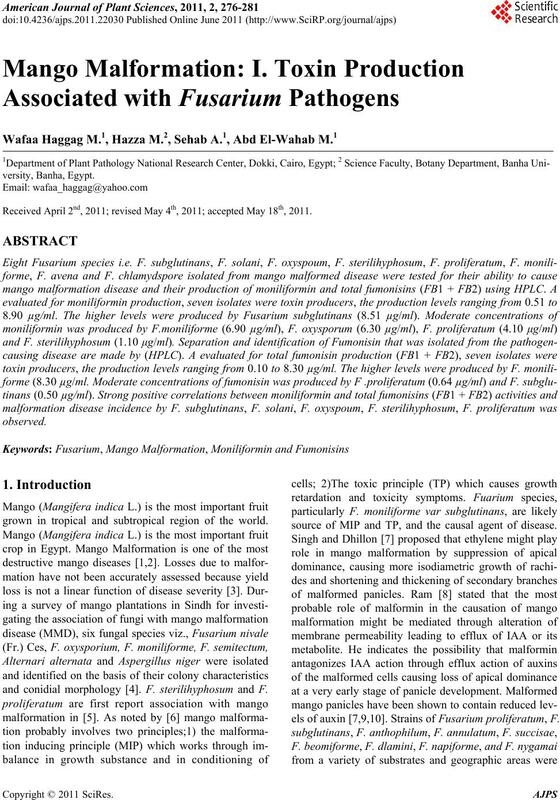 Fungi F.
tion symptoms in inoculated mango seedlings. lates on inoculated mango cv. Sedekia seedlings. rium isolates in liquid media. rium dependent on the species. tion was obtained by F. chlamydospore (0.60 µg/ml). the species i.e. 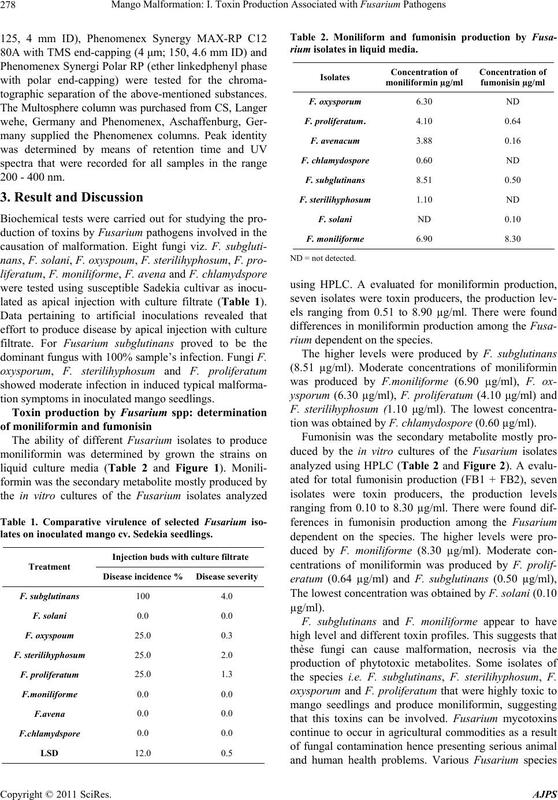 F. subglutinans, F. sterilihyphosum, F.
quently disturbed metabolism inducing malformation. Figure 1. 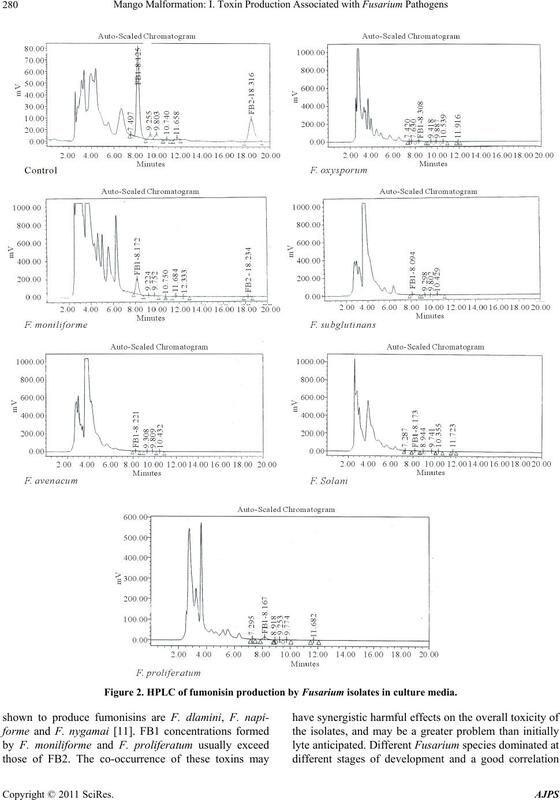 HPLC of moniliformin production by Fusarium isolates in culture media. Figure 2. HPLC of fumonisin production by Fusarium isolates in culture media. was found between fumonisins and the presence of F.
fumonisin B# in the laboratory . dad, Vol. 67, 1990, pp. 143-148. Tropical Pest Management, Vol. 33, 1987, pp. 208-210. 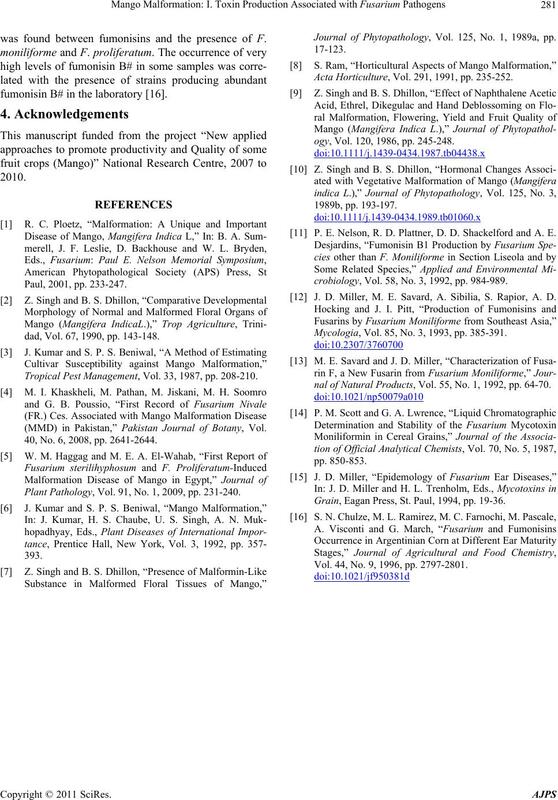 (MMD) in Pakistan,” Pakistan Journal of Botany, Vol. 40, No. 6, 2008, pp. 2641-2644. Plant Pathology, Vol. 91, No. 1, 2009, pp. 231-240. 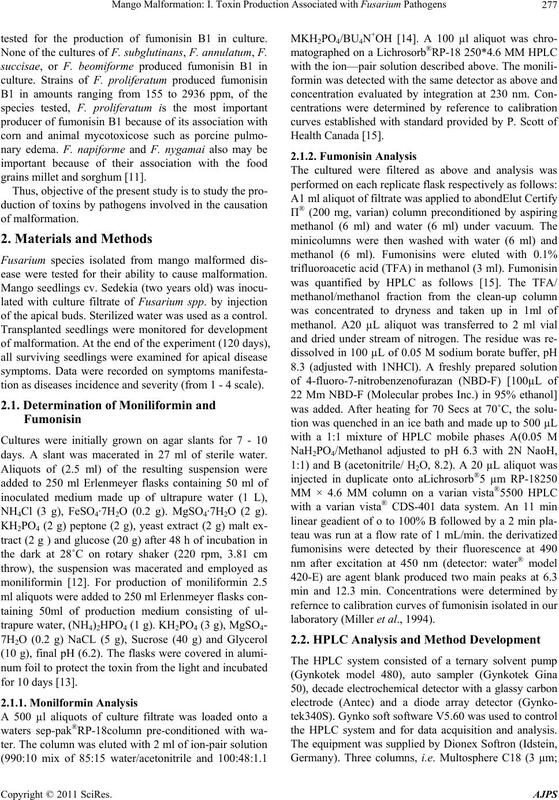 Journal of Phytopathology, Vol. 125, No. 1, 1989a, pp. Acta Horticulture, Vol. 291, 1991, pp. 235-252.
ogy, Vol. 120, 1986, pp. 245-248. P. E. Nelson, R. D. Plattner, D. D. Shackelford and A. E.
crobiology, Vol. 58, No. 3, 1992, pp. 984-989. J. D. Miller, M. E. Savard, A. Sibilia, S. Rapior, A. D.
Mycologia, Vol. 85, No. 3, 1993, pp. 385-391.
nal of Natural Products, Vol. 55, No. 1, 1992, pp. 64-70. Grain, Eagan Press, St. Paul, 1994, pp. 19-36. Vol. 44, No. 9, 1996, pp. 2797-2801.